Wherever you experience the love of God, it is always personal, intimate, and life changing. The key to learning and choosing love is tapping into divine love. The craving for love is our deepest emotional need. We feel love and are drawn to others when they speak love in a way we understand. This same principle applies to the most important relationship-our relationship with God. Did you realize that the God of the universe speaks in your love language, and that your expressions of love for him are shaped by your love language? Learn how you can give and receive God's love through the five love languages-words of affirmation, quality time, gifts, acts of service and physical touch. 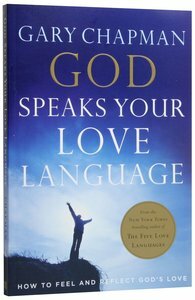 Dr. Chapman's goal for readers is that they may be led to explore the possibility of speaking different love languages to God, and thus expand their own understanding of God and others. Wherever you experience the love of God, it is always personal, intimate, and life changing. The key to learning and choosing love is tapping into divine love. The craving for love is our deepest emotional need, and we feel it and are drawn to others when they speak love in our language. This same principle applies to the most important relationship--our relationship with God. Gary writes, "As we respond to the love of God and begin to identify the variety of languages He uses to speak to us, we soon learn to speak those languages ourselves. Whatever love language you prefer, may you find ever deeper satisfaction in using that language in your relationship with God and with other people." Contains personal reflection questions and a study guide for groups. About "God Speaks Your Love Language: How to Feel and Reflect God's Love"
New York Times best-selling author, Dr. Gary Chapman seeks to fulfil his call to the ministry as a pastor, speaker, and author. He speaks extensively throughout the U.S. and internationally on marriage, family, and relationships. The government of Singapore invited him to present his marriage seminar there and the Chaplainfds Office of NATO issued a special invitation for Dr. Chapman to speak to the NATO forces in Germany. Other engagements have taken him to England, Africa, Saudi Arabia, Turkey, Mexico and Hong Kong. Sales exceeding 5 million copies earned him the Platinum Book Award from the Evangelical Publishers Association for The Five Love Languages, which has been translated into over 36 languages. Almost 30 other books including: The whole Love Languages series; The Five Languages of Apology; Desperate Marriages: Moving Toward Hope and Healing in Your Relationship; Now What? Marriage After Children; Profit Sharing: Making Money An Asset in Your Marriage and Anger: Handling a Powerful Emotion in a Healthy Way, Love is a Verb; God Speaks Your Love Language; The Family You've Always Wanted, plus five DVD series are also among his publications. He also hosts a weekly radio program Building Relationships with Dr. Gary Chapman, which airs on more than 170 stations. On the home front, Dr. Chapman is Senior Associate Pastor of Calvary Baptist Church in Winston-Salem, North Carolina with over 35 years of pastoring and marriage counselling experience. He and his wife, Karolyn, have two adult children and two grandchildren.